Dense traffic in China has inspired Zhang Yuhan, a student majoring in design, to create a multi-function vehicles using the Volkswagen brand. 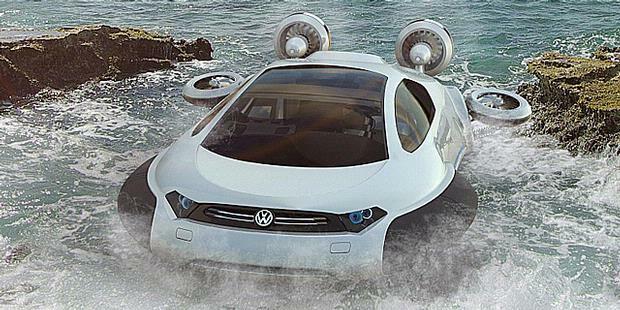 The car is called Aqua VW Concept Hovercraft, which means it can on land and water. Aqua VW Hovercraft is designed as an effective mode of transport for the Bamboo Curtain country. In addition to racing on the lake and river, these vehicles can also drove in a heavy snow though. Yuhan make this concept when he joined the mat CDN Car Design Awards in China, held by former BMW designer and automotive teacher, Chris Bangle. Apparently, Yuhan become one of the finalists.The most prominent of Aqua, hydrogen-fueled propulsion motor. Like the hovercraft that ever existed, when on land, the bottom of the vehicle without wheels that inflate. When driving, two motors are placed in a circle on the rear wheel, plus two at the top (all driven by electric motors), simultaneously will encourage VW Aqua. 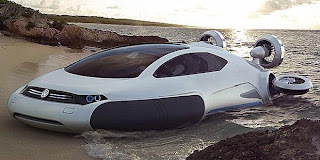 "The basis of this Aqua taken from off-road vehicles of China-made by Volkswagen. He (Aqua) is a futuristic vehicles powered by hydrogen and driven by the impeller (a kind of turbine)," said Yuhan. He explained that the Aqua is driven by several engines, the main form at the bottom of the fan drive. Its function is lifting the body with the help of air pressing down to not hit the ground. Then, additional machines outside the body is pushed forward.